"Caldbeck Avenue and the surrounding area are constantly blighted by littering from the KFC on the High Street. This leads to all sorts of problems – most notably an infestation of foxes who live off the debris at night. However it appears that motorists who may be tempted to throw their rubbish onto the street are now being tracked using CCTV." Or are they? Just who is behind this sign? Well, for starters its clearly just printed on A4 paper and laminated. 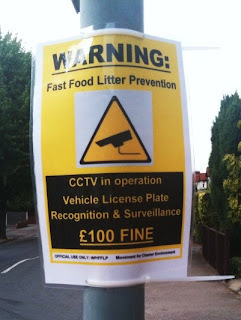 There is no (legally required) mention of who is operating the 'CCTV' which apparently uses 'license plate' recognition (note that American spelling) or who is enforcing the '£100 fine'. Of course there would be no need for 'license plate recognition' technology as it would need human intervention to watch the footage and detect whoever was dropping litter out of their cars. The image of the CCTV camera that is used in the poster is one of the first to appear in a Google images search for 'CCTV sign', the 'for official use' wording is quite obviously a superfluous attempt to lend the sign an air of officialdom and a web search reveals no mention of the 'Movement For Cleaner Environment' who apparently issued this notice. Is this a poorly-produced official poster, or a the work of a well-meaning local resident exasperated at the menace of litter from KFC users. Either way, I applaud their aims.